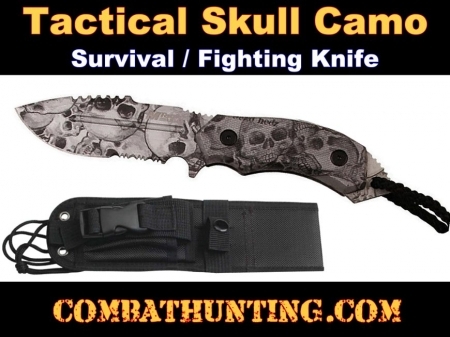 This Skull Camo tactical survival fighting knife with sheath measures 8 inches overall and has a full tang thick fixed blade made for heavy duty use. The Spear point knife blade is perfect for combat or hunting, partially serrated made from 440 stainless steel with fuller blood groove and jimping on rear top of blade prevent your fingers from sliding when using the knife. Knife has quillon protrusion from the handle designed to protect the hand from sliding up the handle onto the edge of the knife and window blunted breaking point / skull denter on handle tang end. The full tang knife and handle are done in a great looking black and gray skull camouflage. The knife handle features lanyard hole and comes with black retention lanyard and black nylon belt sheath with sharpening stone pocket with clip molle Velcro straps on back of sheath. We Recommend A Tactical - Knife Sharpener To Go With Your Combat Hunting Military Survival Knives.